Ella Fitzgerald rose to stardom through a combination of talent and determination. Her father died when Ella was still a baby, and her mother moved from Newport News to Yonkers, New York. There was little money for formal music training, but Ella’s keen ear enabled her to pick up the music of other singers and interpret it in her own style. As a 16-year old, she entered amateur night at the Harlem Opera House on a dare and won first prize – the audience demanding three encores. It was the first of many wins. She was forced to move to Yonkers’ Riverdale Orphanage in 1935 when her mother died. 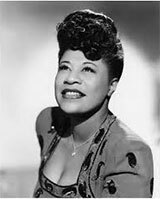 She kept entering amateur nights and was “discovered” at the Apollo Theater in 1935 by Chick Webb. Webb hired the young singer and recorded her first record with his band the same year. Fitzgerald made her professional debut at the Savoy Ballroom in 1936. Webb remained her mentor until his death in 1939. She began writing songs in 1937, for legendaries such as Billie Holiday, Duke Ellington and Nat King Cole. In 1943, her body of work was so large that she was invited to join ASCAP, the youngest person ever admitted to that organization. Among her hundreds of awards are 12 Grammies; ASCAP’s Pied Piper Award; National Medal of the Arts; the first Society of Singers Lifetime Achievement Award (named the “Ella” in her honor); and Harvard’s Hasty Pudding Club’s Woman of the Year. The University of Maryland named an auditorium in her honor and she has received honorary doctorates from Dartmouth College, Howard University and Talladega College.